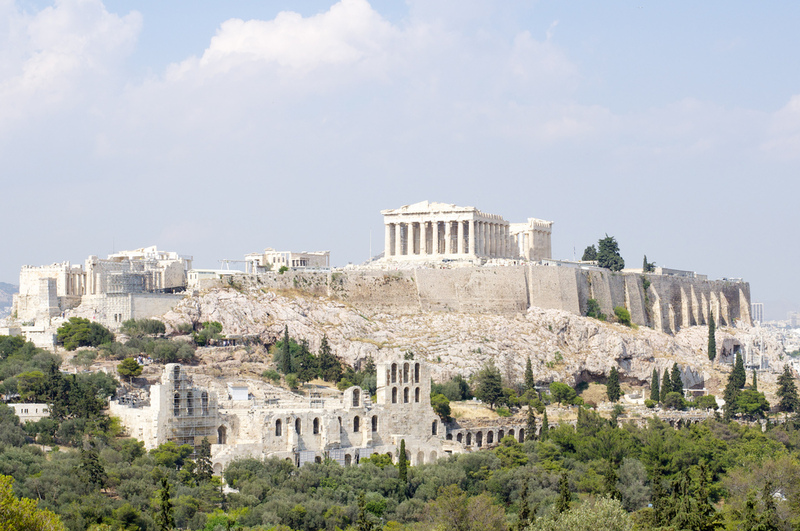 In this post you will find some interesting facts and history of the Parthenon in Athens. The Parthenon is surely the most important monument of ancient Greece and is one of the most famous in the world. It was the most sacred of monuments, and was famous in antiquity as a Greek architectural masterpiece. The Parthenon is located in the southern area of the Acropolis, in the heart of the city of Athens, on top of a hill 156 meters high and visible from several kilometers away. The monument was a temple dedicated to the goddess Athena. The name, “Parthenon”, refers to the epithet of the goddess, “Athena Parthenos” (indicating her status of unmarried and a virgin), and the myth of her creation, by parthenogenesis, from the head of Zeus. In fact, the colossal statue of Athena Parthenos, about twelve meters high, stood inside the Parthenon. To build it, forty talents of gold were used (about 1,140 kilograms of gold) and it cost the city seven hundred talents, the equivalent price of a fleet of 230 ships. However, it is believed that the Parthenon was used primarily as treasury. The Parthenon was built between the middle of the fifth century and 432 BC by architects Callicrates and Ictinus, under the supervision of Phidias, who was also entrusted with the sculptural decoration. The gables, as well as the statue of Athena, were the work of Phidias and described several important scenes. For example, one of them depicts the quarrel that Athena had with Poseidon for possession of Athens and Attica. 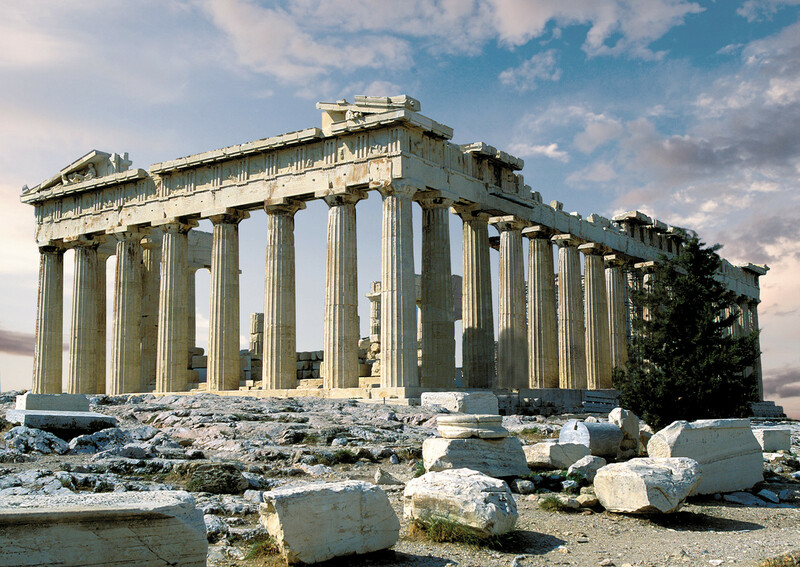 Built entirely of Pentelic marble, the Parthenon rests on a base of three steps. 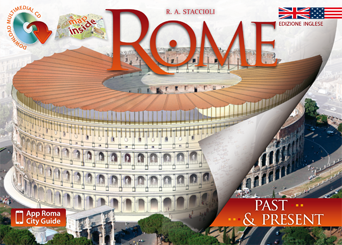 It had eight Doric columns in the front area and 17 columns on the long sides, each 10.43 meters high, and with a base diameter of 1.905 meters. Overall, the Parthenon measured 69.54 x 30.87 meters. The impression of absolute perfection is achieved through the specific composition of the individual elements, and thanks to clever use of barely perceptible optical corrections necessary to harmonize the views of the monument with the human eye. The Parthenon was largely unchanged until the sixth century A.D., when it was converted into a Christian church; later, in 1400, it was converted into a mosque; then it was used as a munitions depot, but most of its sculptures were still preserved. The Parthenon was significantly damaged in 1687, when the Venetians, led by Francesco Morosini, attacked Athens. Many of its sculptures were later recovered and brought to London by Lord Elgin in 1803. Today they are in the British Museum, where they are known as the “Elgin Marbles” or “Parthenon Marbles.” Other sculptures from the Parthenon are in the Louvre Museum in Paris and in Copenhagen. Most of the remaining sculptures are preserved in Athens, at the Acropolis Museum, located at the foot of the hill, not far from the Parthenon. 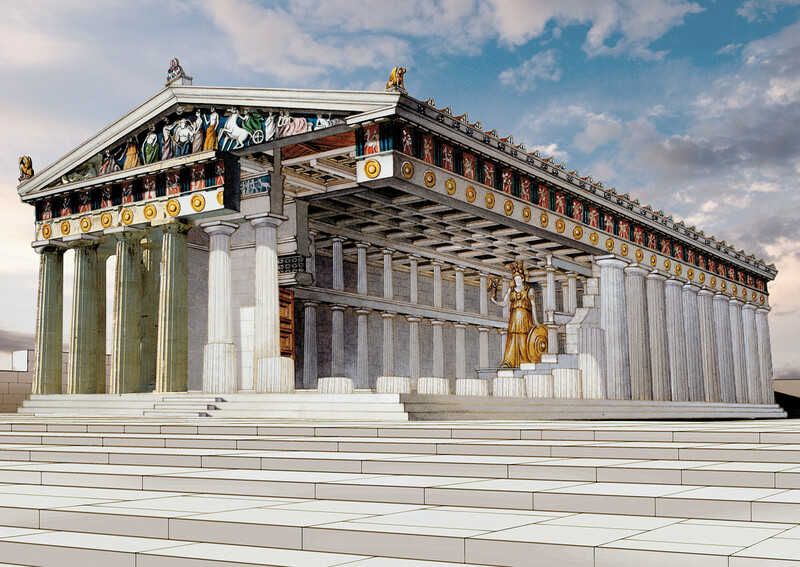 After Greece gained independence, the ancient structures of the Parthenon were freed from the medieval and Turkish superstructures, as well as the rest of the Acropolis. In 1930 it was raised around the northern colonnade, but the restoration work continues to this day. Do you want to know more about the history and architecture of the Parthenon and see how it was originally during Ancient Greece times? 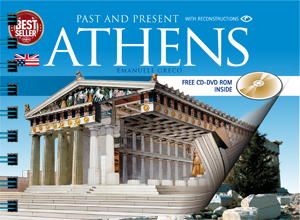 Check out our guidebook to Athens, with detailed history and Past & Present images of the Parthenon, the Acropolis of Athens, the Ancient Agora and all the greatest historical and archaeological sites of Athens. The Parthenon, along with the other buildings on the Acropolis, is now one of the most visited archaeological sites in Greece. The Greek Ministry of Culture, with funding for the Olympic Games in 2004 and funding from UNESCO, has inaugurated a massive restoration project, still in progress. The new Acropolis Museum, which was opened in June 2009, and located at the foot of the Acropolis, collected all the fragments of the frieze of the Parthenon in the possession of the Greek government (along with others still being recovered) in an architectural space rebuilt with the exact dimensions and orientation of the monument.